The Shakespeare-inspired keyboard was created to mark the 400th anniversary of William Shakespeare’s death, and allows users to type phrases inspired by Shakespeare's writing. Keyboard app maker SwiftKey has announced the launch of ShakeSpeak on Android. The Shakespeare-inspired keyboard was created to mark the 400th anniversary of William Shakespeare’s death, and allows users to type phrases inspired by Shakespeare’s writing. The app lets users type words and phrases such as ‘thou,’ ‘thee’ and ‘What ho,’ and contains some of Shakespeare’s most popular phrases in its library. Like the original SwiftKey keyboard, ShakeSpeak will learn from a user’s habits as they type, and will predict what the user is likely to type next. 2016 marks a yearlong celebration of Shakespeare and the incredible literary legacy he has left us. SwiftKey’s technology learns your personal writing style to predict what you will most likely type next. We have trawled thousands of words from his plays for SwiftKey to learn from the great playwright himself, [and] build this personalized language model. 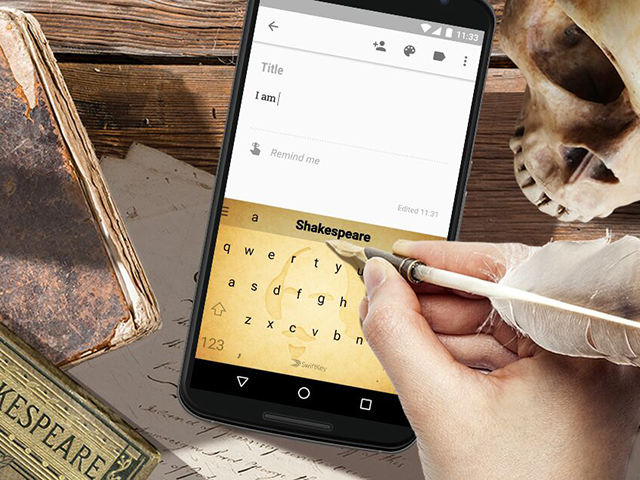 To celebrate the 400th anniversary of his death, the ShakeSpeak keyboard makes the greatest playwright of all time accessible in a new and unique way. ShakeSpeak is available to download for free on Google Play.